Hyperthyroidism is a condition characterized by an overproduction or excessive presence of two key thyroid gland hormones called triiodothyronine, or T3, and thyroxine, or T4. Caffeine consumption will not trigger the onset of hyperthyroidism. However, excessive caffeine consumption can contribute to the intensity of hyperthyroidism by producing certain similar symptoms inside your body. The most common cause of hyperthyroidism in the U.S. is a condition called Grave's disease, according to the National Endocrine and Metabolic Diseases Information Service. People with this disorder have immune systems that mistakenly trigger thyroid hormone overproduction. Other potential causes of hyperthyroidism include overuse of thyroid hormone medications, excessive iodine consumption, the presence of abnormal thyroid nodules called adenomas and a condition called thyroiditis, which makes hormones leak from your thyroid gland into your bloodstream. You can also develop hyperthyroidism if your pituitary gland produces too much of a hormone called TSH, which helps regulate thyroid hormone production. Caffeine occurs naturally in the plants used to make coffee, tea, cola-based sodas and chocolate, and it is frequently added to cold medicines and other nonprescription medications. Most people can drink moderate amounts of coffee -- roughly 250 milligrams, or 3 cups of coffee -- without side effects. However, if you consume anywhere from 500 to 600 milligrams of caffeine per day, you can develop symptoms that include rapid heartbeat, nervousness, insomnia, irritability, muscle tremors, restlessness, anxiety, nausea, vomiting, excessive urine production, depression and an upset stomach. People who don't regularly consume caffeine can develop these symptoms at lower levels of intake. Symptoms of hyperthyroidism that overlap with symptoms of excessive caffeine consumption include rapid heartbeat, sleeping difficulties, irritability, nervousness and other mood changes. Additional potential symptoms of hyperthyroidism include diarrhea, frequent bowel movements, unusual heat sensitivities, muscle weakness or fatigue, hand tremors and a swelling of your neck called a goiter. 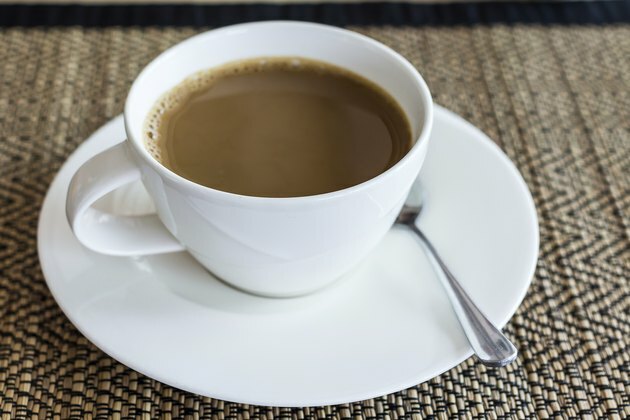 Because of the possible effects of caffeine use, the University of Maryland Medical Center recommends that people with hyperthyroidism consult with their doctors before consuming caffeinated products. Caffeine use can also interfere with the effects of certain medications for hyperthyroidism, notes the University of Maryland Medical Center. While you may need to avoid caffeinated green tea, you can potentially help ease the effects of hyperthyroidism with daily 250 to 500 milligrams doses of a caffeine-free green tea extract. These extracts contain significant amounts of substances called antioxidants, which can support your system by combating the effects of waste molecules in your body called free radicals. Consult your doctor before taking green tea, and ask him for more information about hyperthyroidism and caffeine use. Does Tea Affect the Thyroid?